NAPWO had the most liked content! I started as a crewmember in the field primarily refinishing outdoor wood. I worked myself through the ranks and eventually ran a supply store that was active in the industry and very involved. I am now with NAPWO, a new distributor to the industry. I expect my experiences will allow NAPWO to provide the best service, instruction and products to the pressure washing industry. NAPWO replied to bradcarey's question in Wood Cleaning & Restoration - Decks, Fences, etc. See the new post in the Vendor section or click HERE for the 2016 class. We are looking forward to seeing old, and making new, freinds at this years PWNA convention in Charlotte, NC. Nov 12 - 14th. Hope to see YOU there! Stop by our booth for some crazy savings on items like out ECO WASH House and Roof Wash; EPC (environmentlly prefered cleaner) all purpose cleaner; F9 Battery Acid Restoration Cleaner; #30 Masonry sealer; and more....or get your new Alkota pressure washer! Tracy will teach PW 101 on Thursday afternoon, and PW 201 , an advanced class (covering things like getting into commercial work, bidding, Equipment maintenance; and reclaim) on Fri the 13th! Take this class and make it your lucky day! I hear Beth will be there too! Looking forward to a great few days taking shop. See you at the end of the week! Use Ready Seal wood stain and sealer. Ready Seal is not temp reglated so it can 40 degrees out and as long as the wood is dry, you can apply! Moisute content of wood should be 12% or less, but het, when the other products say don't apply at tempos colder that 50 degrees out, you can use Ready Seal and sill be maiking money. 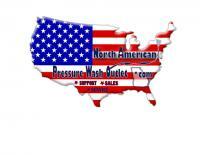 (while also still providing a quality job) North American Pressure Wash Outlet stocks all colors. No freight charges added to your order. Price breaks at purchases of 8 or more, and 15 or more 5 gallon pails. get 36 or more at a time and get the lowest price possible! North American Pressure Wash Outlet also has CLEANERS for your wood care too! We have what effectively takes off oil-based finishes, latex, epoxies, and more.... We offer product support, suggestions on appropriate cleaner selection, and we ship FAST! Tell us how we can provide total care for you and your business! Come to the PWNA convention in November to see the BLEACH BEAST demonstrated.